Install the grommet to the booster. Install the check valve to the grommet. Install a new gasket to the booster. Install the push rod clevis to the booster. Temporarily tighten the push rod clevis lock nut. 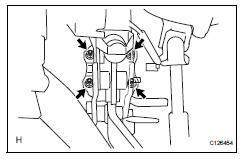 The push rod clevis lock nut will be tightened to a torque specification in the "check and adjust brake pedal height" procedures. Install the booster with the 4 nuts. Apply lithium soap base glycol grease to the push rod pin. Install the push rod pin to the push rod clevis. 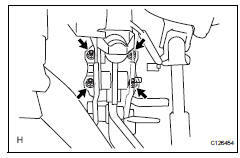 The push rod pin must be installed as shown in the illustration. Install the clip to the push rod pin. The clip must be installed as shown in the illustration. Connect the vacuum hose to the check valve. Install the air cleaner case (see page em-105). Refer to the procedures from the installation of the air cleaner case up until the installation of the purge vsv. Install the air cleaner case (see page em-31). Refer to the procedures from the installation of the air cleaner case up until the installation of the air cleaner cap sub-assembly.